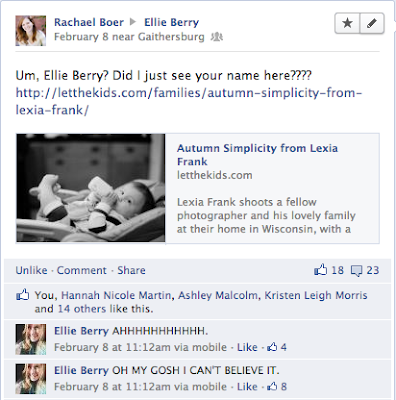 ellie be: storyteller + photographer : i haven't blogged about this? i haven't blogged about this? I saw that Let the Kids (another fantastic blog about fun and beautiful family/children photography) was running a contest. HA. Another contest? Scrolling over that one... on to the next post in my feed! But my eyes caught the words "Yan... Get Back... Workshop." Okay maybe I'll check it out. The prize of this contest was a spot in Diana's "Get Back" Workshop... which is dedicated to helping artists get back to why they became artists in the first place. I was itching to go. I had even talked to my friend Hannah about it a few days before. "I would love to go but, whoooeee the price is steep!" Well Friday did come, and I plumb forgot about the contest. I was laying on our couch, scrolling through my Facebook feed when I saw that Rachael had posted this on my wall. I caught my breath. "Why would my... what day is it? Oh MY GOSH IT IS FRIDAY." I fumbled around to click on the link and open up the post. I scrolled through all of the pictures (sorry Lexia, I went back and looked at your work, phenomenal, really.) and saw it. That... that's my name. It felt like I had been punched in the gut, but in a good way. Is that possible? I literally sprung off the couch and started jumping and running all over the house shouting, "I WON, I WON, I CAN'T BELIEVE IT!!! "My sisters thought I was crazy. And I was... am. But I felt so blessed and so wonderful in that moment. Still can't get over it. A few phone calls to Hannah, and my mom (who was out of town) later and I still couldn't stop smiling. I am overwhelmed with gratitude. As I was thinking about everything, I realized something else. I love surprises. Like parties, visits from friends, anything. I. Love. Them. I don't think that it was an accident that I forgot that it was Friday and that Diana was announcing the winners. God knows I love surprises, and I think He wanted to bless me in that way. How cool. I am so blessed and humbled that I am able to attend her workshop. And that's the cool story of the month folks. Awww that's SO awesome, Ellie!!! Congrats!! I love this. and that phone call. good grief I could hardly breath. but screaming is easier than breathing. we were despicable me tim bob phil right there alright. Ah! Surprises are awesome. And God had this one planned out especially for you! That's such a wonderful thought. :) I'm so excited for you Ellie. I know you're going to have a blast! first of all, you are just freakin' cute. and second CONGRATS! that is so cool!! YAY!! I'm really excited for you, ellie! It's going to be really fun for you :D Have a blast for me!